new creations that are built upon this work are licensed under identical terms or terms compatible with this license. 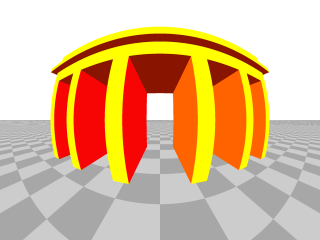 ad 1: If an image is redisplayed, it is to be accompanied with the acknowledgment shown below the image. If pressed for space, the acknowledgment can be included into the list of references, with a citation in the form "Image: Author " in the figure caption,  being a reference to the entry in the list of references. ad 2: If you wish to include images of this gallery in a work of your own, you must give the users of you work at least the same rights that we give the users of these images. I.e. it is not possible to use the images, e.g., in a book or an article that may not be freely copied. Wormholes are traversable connections between two universes or between two distant regions of the same universe. 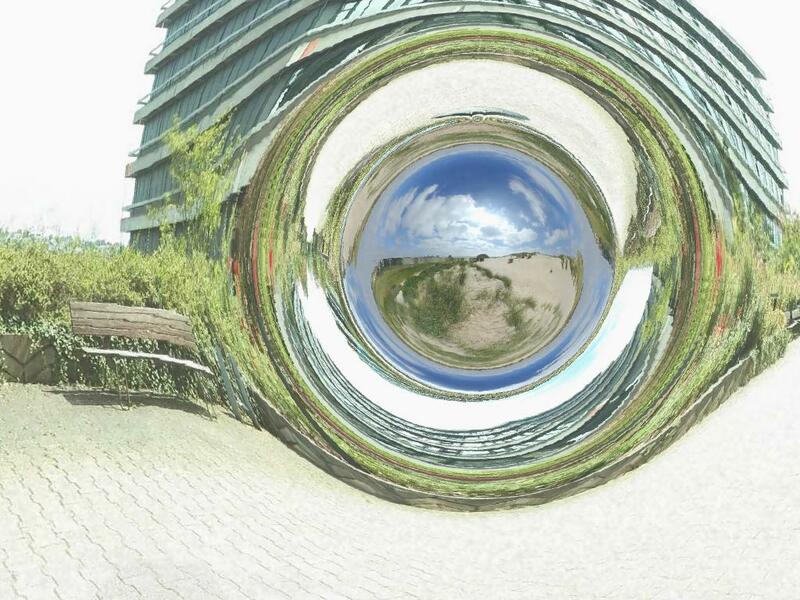 The wormhole shown here connects the place in front of the physical institutes of Tübingen university with the sand dunes near Boulogne sur Mer in the north of France (panorama of the dunes: Philippe E. Hurbain ). License: This image is licensed under "Creative Commons Attribution-Share Alike 2.0 Germany " (abbreviated "cc-by-sa/2.0/de/" ). Please acknowledge as in the figure caption. Description: A few cubes are set up in a row (bottom). 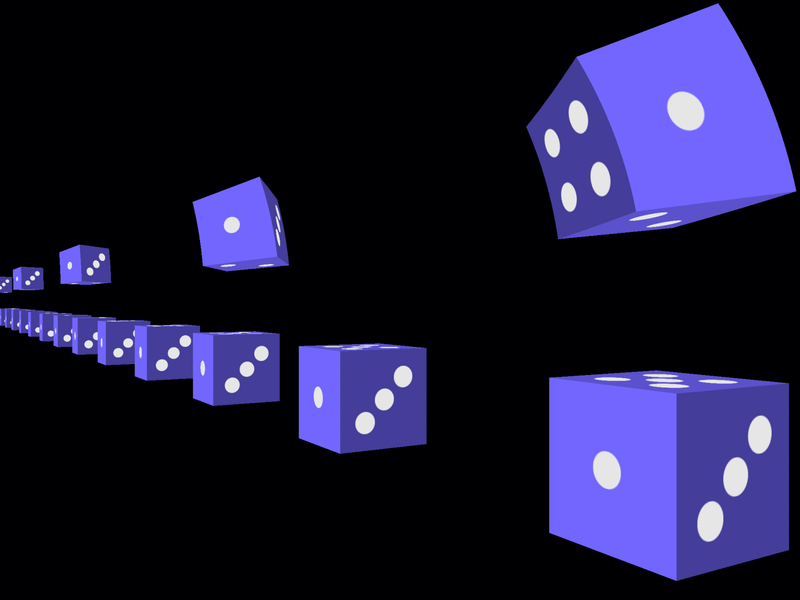 A second row of cubes moves along the first row at 90% of the speed of light (top, motion is from left to right). All cubes, whether moving or at rest, have the same orientation: The face with the "3" is in front, the "4" is on the rear side. The fact that we can see the rear sides of the moving cubes is a consequence of the finiteness of the speed of light. Description: In his book "Mr. Tompkins in Wonderland" George Gamow describes the adventures of Mr. Tompkins in a fictitious world, in which the speed of light is only 30km/h. Motivated by the scene of Mr. Tompkins riding a bike along the street, this picture show what a relativistically rolling wheel "really" looks like. 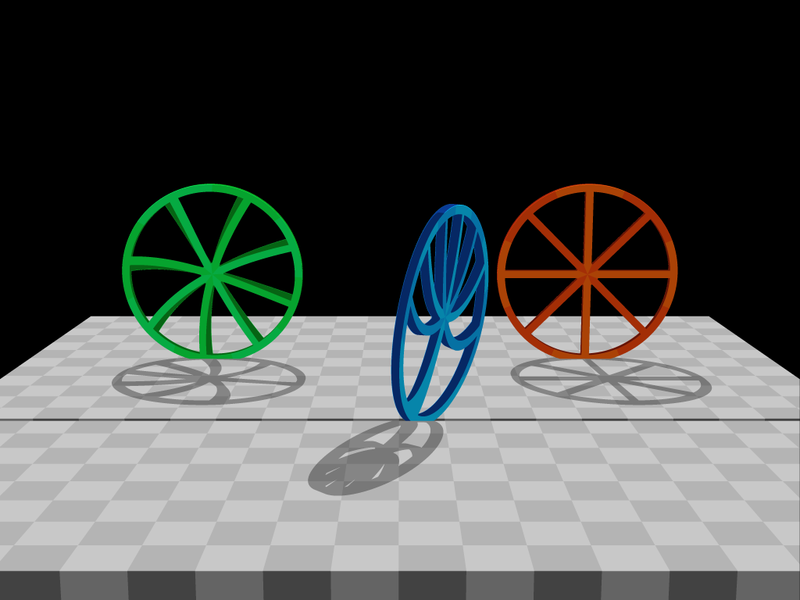 The red wheel in the background is at rest, the green one is in stationary rotation (a point on the rim moves with a speed of 0.93c) and the blue one in the foreground is rolling at a speed of 0.93c from left to the right through the scene. The shadows are due to a light source which illuminates the scene from a great distance from behind and above. Description: Neutron star. 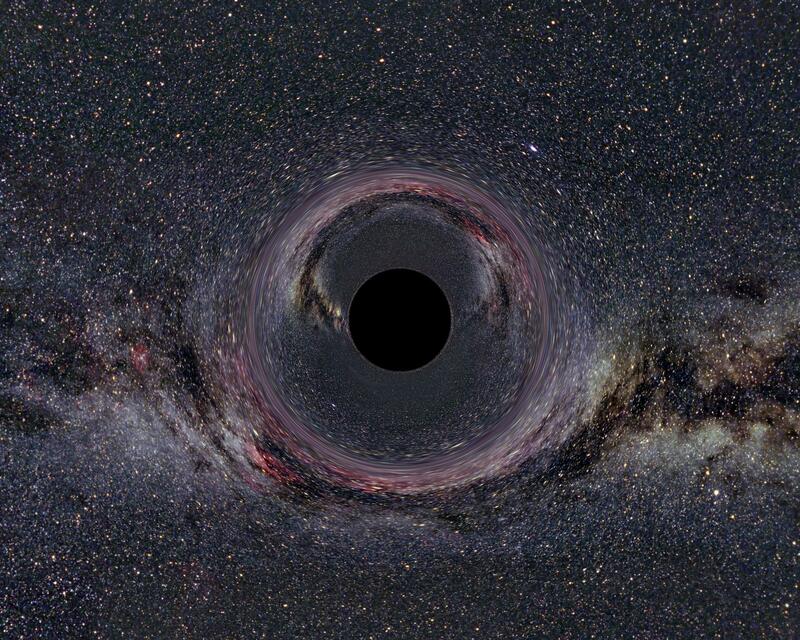 Due to relativistic light deflection more than half of the surface is visible. 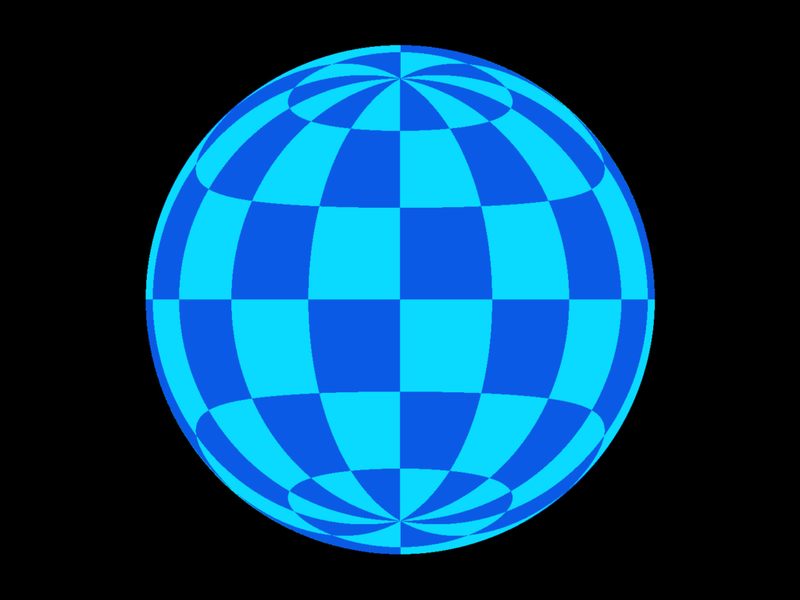 Neutron star mass: 1, neutron star radius: 4, All values are in natural units (c, G = 1). Patches on the chequered surface: 30 degrees by 30 degrees. 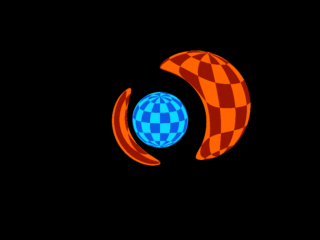 Description: A neutron star (blue) is orbited by a massless companion star (red). When the companion star moves behind the neutron star, it appears distorted because of relativistic light deflection. Geometry and colours of this scene are chosen to clearly illustrate the effects of light deflection. They are not realistic from an astrophysical point of view because, so close to a neutron star, the companion star would not be stable. neutron star mass: 1, neutron star radius: 4, companion star radius: 8, radius of the orbit: 20. All values are in natural units (c, G = 1). Contact: Would you like to send us a message? All contents copyright (C) 2001-2018 Ute Kraus, Corvin Zahn. All rights reserved. For more information see Copyright.